Spherical solar cells self-assembled from flower shaped flat Si leaflets with thicknesses of 2 m: (A) Schematic illustration of steps for fabricating a spherical shaped Si solar cell; (B) Optical image of a complete device consisting of the folded spherical Si shell, inner glass bead, and printed silver electrodes; (C) Magnified view of the silver wire connected to the top contact of the spherical device; (D) Current density (J) - voltage (V) characteristics of a spherical solar cell under AM1.5 simulated sunlight irradiation, with and without a white diffuse reflector. CHAMPAIGN, Ill. - You can think of it as origami. - very high-tech origami. 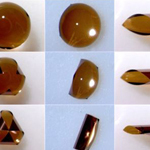 Spontaneously folding of (A) triangular and (B, C) square silicon sheets (1.25 m thick) with a water droplet. Researchers at the University of Illinois have developed a technique for fabricating three-dimensional, single-crystalline silicon structures from thin films by coupling photolithography and a self-folding process driven by capillary interactions. The films, only a few microns thick, offer mechanical bendability that is not possible with thicker pieces of the same material. "This is a completely different approach to making three-dimensional structures," said Ralph G. Nuzzo, the G. L. Clark Professor of Chemistry at Illinois. "We are opening a new window into what can be done in self-assembly processes." Nuzzo is corresponding author of a paper accepted for publication in the Proceedings of the National Academy of Sciences. The paper is to be posted on the journal's Early Edition Web site the week of Nov. 23. 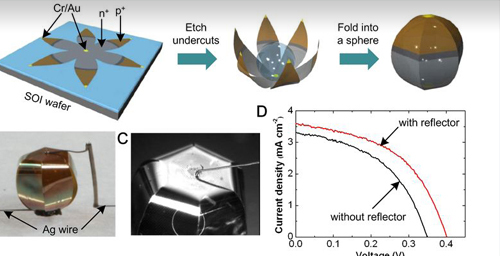 As a demonstration of the new capillary-driven, self-assembly process, Nuzzo and colleagues constructed spherical and cylindrical shaped silicon solar cells and evaluated their performance. The researchers also developed a predictive model that takes into account the type of thin film to be used, the film's mechanical properties and the desired structural shape. "The model identifies the critical conditions for self-folding of different geometric shapes," said mechanical science and engineering professor K. Jimmy Hsia. "Using the model, we can improve the folding process, select the best material to achieve certain goals, and predict how the structure will behave for a given material, thickness and shape." To fabricate their free-standing solar cells, the researchers began by using photolithography to define the desired geometric shape on a thin film of single-crystalline silicon, which was mounted on a thicker, insulated silicon wafer. Next, they removed the exposed silicon with etchant, undercut the remaining silicon foil with acid, and released the foil from the wafer. Then they placed a tiny drop of water at the center of the foil pattern. As the water evaporated, capillary forces pulled the edges of the foil together, causing the foil to wrap around the water droplet. To retain the desired shape after the water had fully evaporated, the researchers placed a tiny piece of glass, coated with an adhesive, at the center of the foil pattern. The glass "froze" the three-dimensional structure in place, once it had reached the desired folded state. "The resulting photovoltaic structures, not yet optimized for electrical performance, offer a promising approach for efficiently harvesting solar energy with thin films," said Jennifer A. Lewis, the Thurnauer Professor of Materials Science and Engineering and director of the university's Frederick Seitz Materials Research Laboratory. Unlike conventional, flat solar cells, the curved, three-dimensional structures also serve as passive tracking optics by absorbing light from nearly all directions. "We can look forward from this benchmark demonstration to photovoltaic structures made from thin films that behave as though they are optically dense, and much more efficient," Lewis said. The new self-assembly process can be applied to a variety of thin-film materials, not just silicon, the researchers noted in their paper. With Nuzzo, Hsia and Lewis, co-authors of the paper are graduate students Xiaoying Guo and Huan Li, and postdoctoral researchers Bok Yeop Ahn and Eric B. Douss. Hsia is associate dean of the Graduate College and is affiliated with the university's Micro and Nanotechnology Laboratory. Lewis is affiliated with the department of chemical and biomolecular engineering and the Micro and Nanotechnology Laboratory. Nuzzo is affiliated with the Institute for Genomic Biology, the Micro and Nanotechnology Laboratory, the materials science and engineering department, and the Frederick Seitz Materials Research Laboratory. The U.S. Defense Advanced Research Projects Agency, the Department of Energy and the National Science Foundation funded the work. Editor's note: To contact Ralph Nuzzo, call 217-244-0809; e-mail: r-nuzzo@illinois.edu.